BarVolo, the well-known beer bar on Yonge St. in Toronto, will be surrendering to a total takeover by Beau’s All Natural Brewing on Thursday March 29. 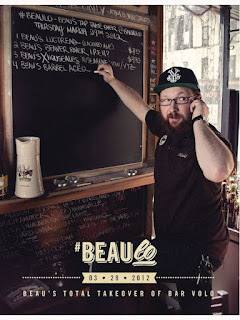 The Eastern Ontario microbrewery will be transforming the bar into “Beaulo” for one night only, featuring Beau’s beer flowing from 13 taps, 7 casks, and 7 different bottles, and a Beau’s-inspired revamp of the BarVolo décor. Featured in the beer selection will be the Ryes Above Porter YOW/WTZ (Rye Porter), a collaboration between Beau’s master brewer Matthew O’Hara, and BarVolo’s own House Ales, which was brewed onsite. Four one-off casks were brewed just for the takeover: an agave pale ale aged with tequila-soaked wood chips, a peanut butter stout, a Belgian quad, and a SMASH (single malt + single hop) brew. A sour version of Ryes Above will also be available for the adventurous beer palate. The beer selection is rounded out with Beau’s flagship beer LugTread and 3 of their 4 seasonals, as well as rare bottles of previous Wild Oats releases no longer for sale to the public. A complete list of the beers for the evening is available online at www.beaus.ca (click on “Events”), and is included below. Beau’s award-winning creative director Jordan Bamforth will complement the vast selection of beer by staging a total transformation of the BarVolo look for the night, replacing artwork and décor with Beau’s art and design. “Beaulo” takes place Thursday March 29, from 7-10 pm at 587 Yonge St in Toronto. Food will be available, and the bar will be cash only. Admission is free (19+) but space is limited, so the thirsty and the curious are advised to show up early. Another Beer Mail from Steam Whistle!